​Colony caretakers that have completed the Trap-Neuter-Return Workshop hosted by Community Cats Toronto may qualify for free equipment rental (a credit card number is required as a deposit). Caretakers must provide provide proof of completion of the TNR course (a copy of your certificate). Anyone unable to provide this will be charged a flat rental fee of $10 per trap per week. Payment is to be by cash only and exact change must be provided. Equipment rentals are based on availability. Equipment may be rented for a MAXIMUM of 14 days after which is MUST be returned, otherwise overdue charges of $5 per trap per day will be applied. THERE ARE NO EXCEPTIONS TO THIS! If you need traps for a longer period, then you will need to make a new reservation a minimum of 48 hours in advance of the return date, and you can bring your traps back and exchange them for others. NO TRAP IS TO BE OUT OF OUR FACILITY FOR LONGER THAN 14 DAYS! 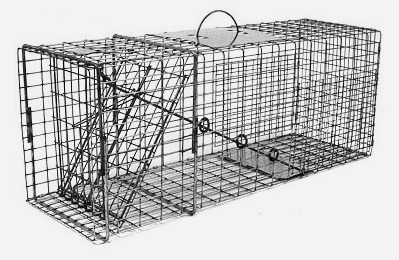 Trappers are eligible to a maximum of 6 traps at any given time, again based on availability. A request to rent traps can be made by filling out the form at THIS LINK. Please note that we require a minimum of 48 hours notice to process trap rental requests. No drop in pick ups are permitted. Once you have requested traps you will be notified by email of The Recovery Centre's hours for the date(s) in question. If you have not received notification within 48 hours of placing the request, please email us at rc@torontocatrescue.ca. If you need a trap divider, a $60 CASH ONLY deposit per divider must be left when picking up the dividers. This will be reimbursed upon return. Trap dividers are in limited supply and will not always be available when renting a trap. If you wish to keep a divider, speak to a Recovery Centre volunteer. If you need covers for your traps, we often have a supply of donated sheets or towels of which you are welcome to help yourself. Inquire with the Recovery Centre staff. Custom made folding drop traps and box traps are now available for purchase from Toronto Street Cats. More information can be obtained by inquiring at tnrths@gmail.com.